Originally published under the title, "Iran Working as Strategic Partner with Hezbollah Against Israel." IDF artillery prepare to return fire following a Hezbollah attack that killed two soldiers in the northern Mount Dov region along the Israel-Lebanon border on January 28. All is not quiet on the northern front between Israel and Syria/Lebanon. 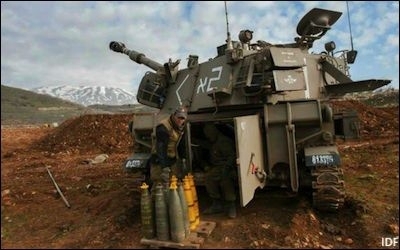 The recent Hezbollah attack on an Israel Defense Forces convoy in the Har Dov area close to Israel's border with Lebanon, in which two Israeli soldiers were killed, was the latest move in a dangerous and high stakes game that is now underway on Israel's northern frontier. Israel and Hezbollah are not the only players. The Islamic Republic of Iran, which the U.S. defines as the leading state-sponsor of terrorism, is also a key presence as Hezbollah's strategic partner. The attack at Har Dov was the second move by Iran/Hezbollah in response to the Israeli operation on the Syrian Golan Heights on January 18th. In the Israeli operation, a senior Iranian Revolutionary Guards officer, Mohammed Allahdadi, was killed, as was Jihad Mughniyeh, the son of a famous Hezbollah commander. Israel appears to have chosen not to immediately respond to the Hezbollah attack. As a result, fears of an imminent escalation to full conflict between the Jewish state and the Lebanese Shia Islamists have diminished. But the silence is deceptive. The border incidents cast a sudden light on an ongoing war between Israel and Iran that is more usually played out in the shadows. The commander of the Iranian Revolutionary Guard Corps (IRGC) Aerospace force Brigadier General Amir Ali Hajizadeh announced on February 2nd that his country has exported technology to Hezbollah "for the production of missiles and other equipment, and they can now stand against the Zionist regime." Just last week, the IRGC, Hezbollah and Assad's soldiers launched an offensive in the direction of the Golan Heights to reclaim territory seized by Syrian rebels and jihadis. The offensive seems to have stalled amid the February snow for now. But the Iranian/Hezbollah determination to drive the Syrian rebels away from the border area is clearly intact. This ambition lies at the root of the tensions on Israel's northern border. The Israeli strike on January 18th was a response to an attempt by Iran and Hezbollah to re-write the delicate "rules of engagement" that pertain between Israel and the Shia Islamist organization in Lebanon and now in Syria. Could the Golan Become a Front for Attacks on Israel? The Iran/Hezbollah/Assad troika has long threatened to develop the Golan as a front for possible "jihad duties" against Israel. Syria is in chaos. The area east of the Israeli-held Golan is precisely the kind of lawless territory from where Iran's regime and its proxies would find it suitable to launch acts of violence against Israeli communities. Syria and Hezbollah have made unambiguous public statements threatening military activity against Israel in this area. Both Syrian President Bashar Assad and Hezbollah's leader Hassan Nasrallah, in the course of 2014, made unambiguous public statements threatening the opening of military activity against Israel in this area. Iranian General Allahdadi, Mughniyeh and the others were in the Golan Heights as part of the effort to make these statements a reality. They were, it appears, in the process of preparing an infrastructure for attacks on Israel. Israel acted to prevent this, but also to send a broad and clear message to Iran/Hezbollah that it would not tolerate the establishment of a second springboard for attacks on Israeli communities, just east of the Quneitra Crossing. The emergence of a terror infrastructure facing the Golan, with regular attacks from Hezbollah or (more likely) un-named proxy groups could lead the Jewish state to face the alternative of accepting a war of attrition against northern communities or entering to prevent it. So Israel is determined to prevent the emergence of that reality. In pursuing this mission, Israel relies only on its own capabilities. This is a stance born from bitter experience. The guarantees of the "international community" have proven to be an ineffective barrier to the ongoing march of Teheran's ambitions. Just north of Israel's border with Lebanon, Iran and Hezbollah have constructed a powerful war machine. The existence of UNSC Resolution-1701, intended precisely to prevent this, has done nothing serious to even hinder this process. Since Hezbollah last attacked Israel during the 2006 Second Lebanon War, a beefed-up UNIFIL's (United Nations Interim Force in Lebanon) mandate has been to restore peace to the border and assist the Lebanese Armed Forces in disarming Hezbollah. The mission has failed. Hezbollah has likely amassed over 100,000 rockets. It has also infiltrated the Lebanese Armed Forces, to the point wherein many ways it can no longer be reliably discerned where Hezbollah ends and the Lebanese Armed Forces begin. 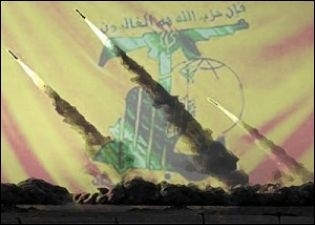 Hezbollah is believed to have amassed over 100,000 rockets capable of striking Israeli territory. By way of background, the U.S. designated Hezbollah a terrorist organization in 1995. The long bloody trail of Hezbollah's terrorism can be traced back to 1983. Hezbollah launched a suicide bomb attack against U.S and French military barracks in Beirut. The terror attacks resulted in the deaths of 241 American military personnel and 58 paratroopers. Hezbollah's jingoism against the U.S. did not end in Lebanon; its operative Ali Mussa Daqduq played a key role in murdering five U.S. soldiers in Iraq in 2007. Recently, the Washington Post published details of U.S.-Israeli cooperation in the assassination of Hezbollah's terror mastermind, Imad Mughniyeh, in Damascus in February, 2008. The latest revelations cast light on the extent of ongoing behind the scenes cooperation against the common threat represented by Iran and Hezbollah. This campaign is a marathon, not a sprint, with achievements and setbacks, moments of greater intensity and periods of waiting. Deterrence, as Admiral Eliezer Marom, former commander of the Israeli Navy, said in an interview on Israeli Channel 1 News following the Har Dov attack, is not an exact science; it's an art. Israeli decision-makers have apparently decided to bring the current episode to a close with no further immediate escalation. This decision was presumably not easily reached. Silence is not necessarily cost-free. With the Iranian ambition very clear, Israel needs to consider whether accepting Hezbollah's signal to the UNIFIL may mean that the organization and its backers will now feel emboldened to continue to regard the Golan as an "open" front, in the knowledge that Israel's responses, though kinetic, would be limited. The broader picture, in any case, seems clear after the latest events. The eight years of relative quiet that followed the Second Lebanon War of 2006 are over. The northern border is back to being an active arena in the Israel-Islamist conflict. Lastly, Iran's growing role in destabilizing Israel's borders should debunk any idea that President Hassan Rouhani is a moderate leader within the Middle East. The Iranian effort to open a "second front" against Israel in the Golan should be seen as part of a larger regional picture in which the Iranians are actively interfering in conflict areas throughout the Middle East — in Iraq, Yemen, Syria, Lebanon, the West Bank/Gaza, and now once again across Israel's northern border. Dr. Jonathan Spyer is a senior research fellow at the Global Research in International Affairs Center in Herzliya, Israel, and a fellow at the Middle East Forum. Benjamin Weinthal is a fellow at the Foundation for Defense of Democracies. Follow Benjamin on Twitter here.